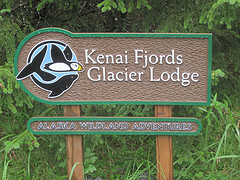 Welcome to the only lodge within the 700,000 acre Kenai Fjords National Park! 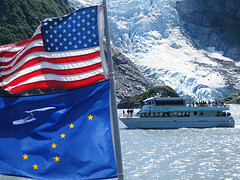 Kenai Fjords Glacier Lodge is an Alaska eco lodge completely surrounded by Kenai Fjords National Park. Situated on the shores of a protected lagoon in full view of Pedersen Glacier, Kenai Fjords Glacier Lodge offers an unprecedented way for Alaska travelers to experience Kenai Fjords National Park. Featuring an elegantly rustic main lodge and sixteen nicely appointed cabins, the Glacier Lodge pairs modern comfort with the wilds of remote Alaska. By day, guests can choose from a range of activities to match individual interests and energy levels, from guided nature walks to sea kayaking through the lagoon and Aialik Bay. More relaxing options include strolling the pristine beachfront or perusing the naturalist library. In the evening, the lodge serves as the dining room and lounge, featuring wilderness fine dining and a stunning view of Pedersen Glacier - the ideal venue to relax in appreciation of Alaska's majestic beauty. As an Alaska eco lodge, Kenai Fjords Glacier Lodge was built to minimize the impact on the natural area and is managed with a strong commitment to ecological sensitivity. By providing so many diverse and engaging activities at one ideal location, the lodge reduces the energy footprint of travel. 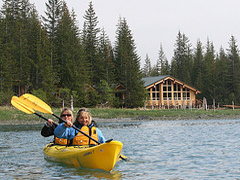 Additionally, the total number of guests at the lodge is limited to minimize environmental impact. To learn more, visit our ecotourism in action page. 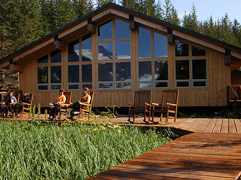 The Lodge and guest cabins reside within the Native-owned, 1,700 acre Pedersen Lagoon Wildlife Sanctuary. These heritage lands, owned by Port Graham Native Corporation, represent a small portion of the ancestral homeland of the Alutiiq people that once lived along and roamed the entire coast of Southcentral Alaska.